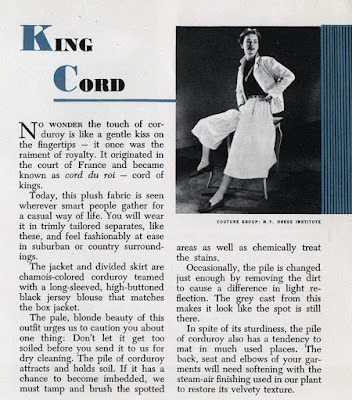 I'm not sure how many people are wearing corduroy these days -- but I figure more than a few vintage fashion lovers are, so I'm posting this article from the November 1953 issue of Silhouette Magazine (a publication for a dry cleaning service) entitled "King Cord." The pile of corduroy attracts and holds soil. It it has a chance to become imbedded, we must tamp and brush the spotted areas as well as chemically treat the stains. Occasionally, the pile is changed just enough by removing the dirt to cause a difference in light refraction. The grey cast from this makes it look like the spot is still there. Which I suppose, leads us to at least giving tamping and brushing a wider area a try to see if we can better camouflage the area(s). In spite of its sturdiness, the pile of corduroy also has a tendency to mat in much used places. The back, seat and elbows of your garments will need softening with the steam-air finishing used in our plant to restore its velvety texture. Something else we can do, with steamers or simply hanging the corduroy garment in the bathroom when we take our next shower, after trying to tamp and brush the matted areas.